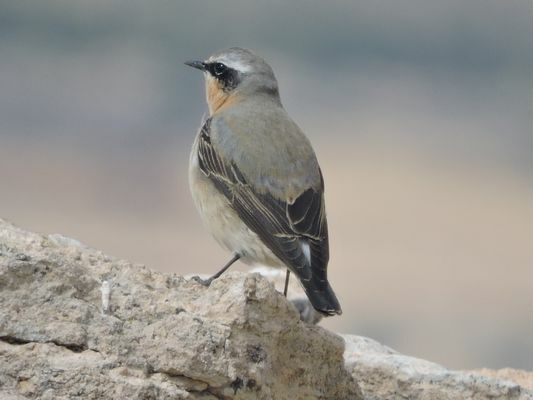 The Costa Blanca Bird Club was unwise enough to schedule its early April field meeting for the plains of Yecla, and when twenty hardy members first ventured from their vehicles on the barren wastes, it felt more akin to the steppes of central Asia, as a bitter wind swept across. Larks were, however, plentiful, with the big Calandra Larks now joined by dainty, sandy little Greater Short-toed Larks. Two or three Chough flew close by, and a Little Owl perched on a big pile of stones. Pete spotted a small group of Little Bustards, flying some way to the west, but most didn’t really see them. 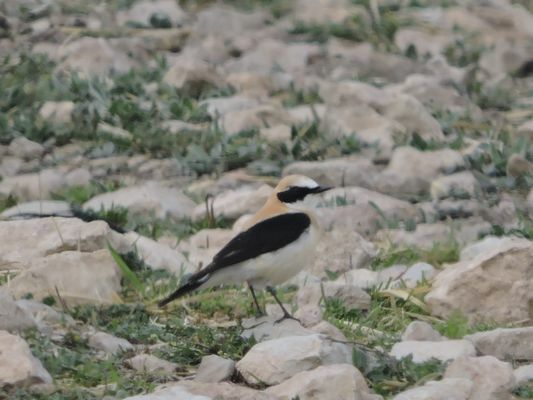 Barry’s sighting of a couple of Pin-tailed Sandgrouse, and a couple of Northern Wheatear were just about all we had to tot up, until, in a more sheltered spot, a nice Black-eared Wheatear became the morning’s best find. Lunch called, and the restaurant Lengüetera, in Caudete, did us proud, with what we all voted a really excellent repast, before we ventured forth once more. With the weather looking ever more threatening, leader David took us along a rocky track, until, at last, we managed to get a great view of six Little Bustards, one of which was a fine, displaying male. Always good to see, this is a species which is now under increasing threat on a European scale. Two early Bee Eaters flew right overhead, calling loudly. One carload managed to see two Stone Curlews, and we were then all treated to a ‘fly-past’ by a group of perhaps twenty Pin-tailed Sandgrouse. It had been a nasty day, as far as weather was concerned, more than compensated by some excellent birds.